Overview: From the planet Thanagar, police officers Katar and Shayera Hol travel to Earth pursuing a fugitive. Dressing in their traditional Thanagarian police uniforms, which makes them look like human hawks, the officers make contact with the local police commissioner George Emmett before apprehending their suspect. Finding Earth interesting, Katar Hol and his wife decide to remain here and study the police methods of Earth. The citizens of Midway City (as well as the Earth) find themselves under the protection of Hawkman and Hawkgirl. The heroes take civilian identities of Carter and Shiera Hall, archeologists and curators at the Midway City Museum. Their jobs lead them around the world on assignment, where they encounter various situations which call on them to don their wings. Some early super-villains are introduced here which will vex the Thanagarians. The most prominent and challenging is the Shadow Thief, but other foes like I.Q. and Matter Master will reappear over and over as well. A lot of Hawkman’s opponents are criminal Thanagarians fleeing to Earth to escape prosecution. What’s interesting with these stories for this era of the 1960s is that Hawkman interacts with a lot of other heroes. Most characters stayed in their books, never to interact with other characters in the DC Universe. In this volume, we see appearances by Aquaman, Adam Strange, the Atom, and Zatanna, making her DC Universe debut. Why should these stories be Showcased? : This is a challenging read to get through, although it does get easier as it moves along. For Hawkman fans, this should be a must read. At this era, the origin and history of Hawkman was so simple and uncomplicated. Hawkman’s origins gets really messy over the next 40 years, so enjoy this while it remains easy to keep straight. 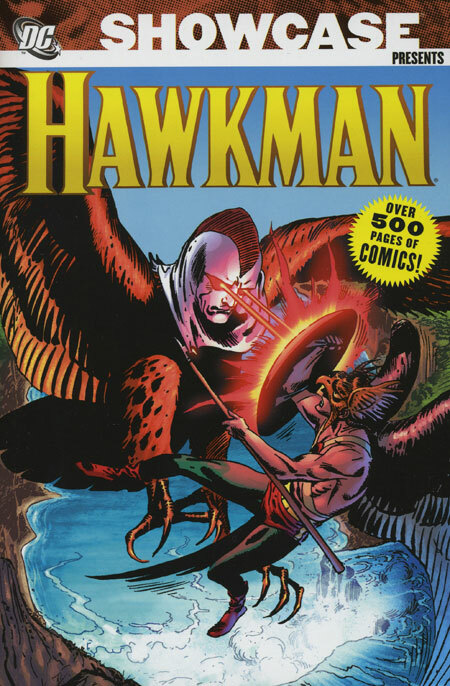 For a DC Universe fan, you may want to skip ahead and read Showcase Presents Hawkman Vol. 2. Honor Wings: When the stories start, Hawkman is wearing more of a rounded helmet similar to what the Earth-2 Hawkman wore, but covered in feathers. At the end of The Brave and the Bold #42, Katar Hol is recognized by leaders on Thanagar for his efforts in bringing a criminal to justice, and is awarded the Honor Wings. These are the wings we see on the side of his helmet, giving him the more traditional look of the Earth-1 Hawkman. Footnotes: The Brave and the Bold #51 is also reprinted in Showcase Presents Aquaman Vol. 2. The Atom #7 is also reprinted in Showcase Presents The Atom Vol. 1. If you like this volume, try: JLA: Zatanna’s Search, a trade paperback released in 2004. When Zatanna first appeared in Hawkman #4, she was on a search for her missing father, Zatara. (Zatara had been a popular character in the Golden Age, with his debut in Action Comics #1.) Zatanna’s search carried her across the DC Universe, leading to encounters with Hawkman and Hawkgirl; Batman and Robin; Atom; Green Lantern; and Elongated Man. Her search finished up in Justice League of America #51 (found in Showcase Presents Justice League of America Vol. 3), where she once again teamed-up with the heroes she had previously encountered. All of her appearances were written by Gardner Fox, as he created what is considered to be the first company-wide story arc, albeit over a three-year period. This entry was posted in DC Showcase Presents, Hawkman and tagged Gardner Fox, Hawkman, Joe Kubert, Murphy Anderson. Bookmark the permalink. Pingback: Throwback Thursday – Showcase Presents Hawkman Vol. 1 – WORST. COMIC. PODCAST. EVER!